Riding dirt bikes is great fun and there's no reason women can't join in the adventure. The keys to success are getting the right bike, having a safe place to practice, and riding at your own pace. When it comes to buying a dirt bike the basic criteria of choosing a bike based on the available riding area, the dirt bike's size, weight, the rider's personailty, and athletic ability is the same for all riders, men or women. Here are a few things beginning women riders should think about when considering buying a dirt bike, or deciding if it's a sport they would enjoy. You probably know that you need to buy safety gear long before you buy a dirt bike, but it can't hurt to mention it again (and again). Although the full outfit of helmet, goggles, gloves, jersey, pants, boots, chest protector, and neck brace is a good idea, the first and most important item is a good dirt bike helmet, preferably one with a Snell rating. If you need more info about dirt bike helmets you can check out this Buying a Dirt Bike Helmet post. There are many online stores that sell women's dirt bike and motocross gear so try searching for 'women's dirt bike gear' and 'women's motocross gear' which should bring up the various online stores. Some of the manufacturers are Fox, Shift, Thor, Alpinestars, MSR and Answer. Seat height is one of the biggest safety considerations for beginner riders, and is especially important for women riders, who are typically shorter than men. All beginner dirt bike riders lose their balance no matter how careful they are, and being able to touch the ground will definitely lower the number of times you and your bike actually hit the dirt (and will need to be lifted back up). You want to be able to keep the bike upright when you stop or stall, so being able to touch the gound with at least one foot is important and the bigger the bike, the more important this becomes. Touching the ground with the just balls of your feet is fine, but if the bike is a kickstart, you're going to be hating life every time you try to start the bike if you can't reach the ground with at least one foot in order to steady the bike when kickstarting. Men are taller (more leverage) and have more muscle mass (strength), so picking up a 250 pound bike is less of a struggle for men than it is for women. You're going to be riding off-road so the ground might be rutted, muddy, or full of slippery trees roots, which makes lifting the bike even more of a chore. Don't assume that a smaller bike weighs less. Entry level beginner dirt bikes aren't normally built with high-end components. They're meant to be casual trail bikes, not race bikes where light weight is very important. The bike's weight will also come into play when loading and unloading the bike on a truck or trailer because the bike will need to be pushed up the ramp onto the truck or trailer, so if you're going to be loading the bike yourself take that into consideration and try pushing the bike around before buying. Motocross is a very aggressive sport. It's fast, furious, and sometimes unforgiving, but also loads of fun. You won't find any princesses or divas on the motocross track. A big drawback for women wanting to ride a motocross bike is the tall seat height of most mx bikes, and most of the smaller (250cc) motocross bikes do not have electric starters yet, which makes the tall seat height even more of a problem because they need to be kickstarted. The other drawback (for beginners) is the snappy power delivery of motocross bikes. Even the four strokes are made for short, fast bursts of speed. If you want to try motocross it would be really helpful to have someone show you the ropes and explain the safety procedures and track etiquette before you plunk down thousands of dollars for a bike you'll be too intimidated to ride. Spend a day or two hanging out at the track and see if you can find someone willing to help you get started. 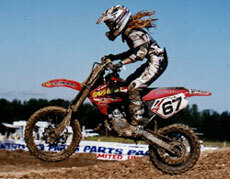 **Note image credit - the two photos on this page are of Ashley Fiolek (#67) and Hannah Hodges (#16), two very successful women motocross riders. Honda CRF125F and CRF125FB (Big-Wheel version), Kawasaki KLX 140, Suzuki DRZ 125L, and Yamaha TTR 125 LE. For taller riders there is the Honda CRF 230 and the Yamaha TTR 225. These two bikes are fairly heavy though, so be sure to push the bike around the parking lot and try picking it up before buying. Honda CRF250, Kawasaki KX250F, KTM 250SX-F, Suzuki RM-Z250 and Yamaha's YZ250F. Honda also has a 150R which has a much lower seat height than the other motocross bikes. Don't forget though - these bikes aren't really for total beginners. Two stroke or four stroke? Two stroke dirt bikes are an absolute blast to ride whether track or trails, but they may not be the best choice for a beginner. If you have some experience, you should be fine with the two stroke but total beginners might want to stick with a four stroke. The Kawasaki KX100 is a two stroke and it has a low 34.3" seat height, but don't let its small size fool you. This little bike can rip! One other bike worth mentioning is the brand new KTM Freeride. It's a two stroke, but it's a very well behaved two stroke that is lightweight and has a low 36" seat height. You can read more about the KTM Freeride here. Almost all beginner trail bikes now have electric start but if you're buying an older used bike or a motocross bike it may be kickstart only. Before you buy the bike make sure you try kickstarting it yourself, especially if you're a bit on the short side. Don't let the dealer or seller do it for you. If you'll be riding the bike out on trails you can usually find something to stand on to get more leverage, but there's not many logs, rocks, or stumps on a motcross track. Sometimes the bikes have e-start with a kickstart as a backup, but even if the bike does have electric start it might not be a bad idea to try kickstarting it just to get the hang of it in case the e-start craps out on you one day. Here are two videos highlighting the (somewhat difficult) kickstarting process. The first video is 2:32 minutes long. It looks like she's on a Honda 150f and it's kind of fun to watch although she never actually gets the bike started, even though she's tall enough to reach the ground easily. The second video (3:31 minutes) is a woman on a Yamaha TTR 125. The sound isn't the best but it does a good job of showing the kickstarting process. She finally gets the bike to fire at 2:30.